Sunday August 24th we began our seminar at sea onboard Carnival Breeze out of Miami, Florida. Since we had priority boarding, it wasn't long after completing the embarkation process that we were on our way to our cabin. Most ships wouldn't have the cabins ready that early, but starting around 12:30 PM, you could go to your cabin and drop off your bags. As usual, we had some lunch, which in our case was one of Guy's Burgers. We'll write about those in another post because we want to skip ahead to the relaxing part of the day. After having our burger, we headed to Cloud 9 Spa for a tour of the facility. After all, it was #SpaSunday, so we needed to get some images for our Twitter followers. That was a good excuse don't you think? One of the therapists, pictured above, demonstrated the hot stones technique on our arms. This is by far our favorite treatment, so it didn't take much convincing that we should start our cruise out right. Pictured here is one of the couples treatment rooms that we saw on our spa tour. At the conclusion of the tour we booked the hot stones treatment for right after the mandatory safety drill. TIP: If you plan on having a massage or other spa treatment during your cruise, go to the spa tour and book your appointments. If you can, take advantage of embarkation day specials as well. When we were done with our 75 minutes of the full body massage with hot stones, we certainly felt like we were no longer on a ship, but floating on Cloud 9. We headed back to our cabin after the massage. This wouldn't be our final visit to the spa. In fact it was just the beginning because we also booked the couples pass to the thermal suite which we'll describe in another article. Welcome aboard Carnival Breeze - visit us again to continue the journey. Each Monday afternoon, the Twitter photo travel chat, #travelpics, explores the world focusing on a particular theme. Participants answer questions and share their personal photos with the audience. Beautiful and crazy shapes can be found in nature by looking carefully. The highlight of one of our Inside Passage (Alaska) cruises was when the ship slowly and carefully made its way thru the glacial ice of Hubbard Bay allowing the passengers to get a closeup view of the glacier. 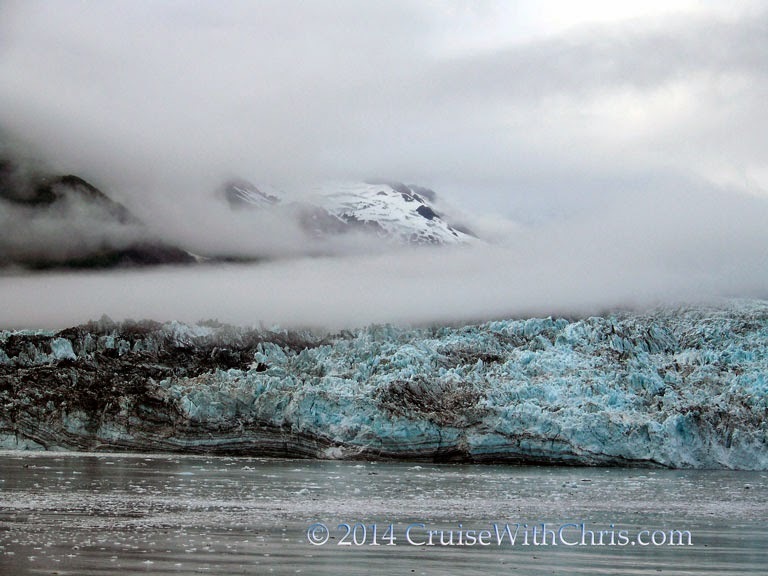 Sailing closer, we past glacial ice that had broken off from the the main glacier in a process known as "calving". There were no two pieces of ice that were the same. They came in all shapes and sizes and the colors were amazing, especially the shades of blue. Our ship even sent a tendor boat to retrieve a chunk of glacier ice and bring it back onboard our ship for the passengers to get a closer look. We hung over the side of our balcony taking several pictures of the ice and the glacier. 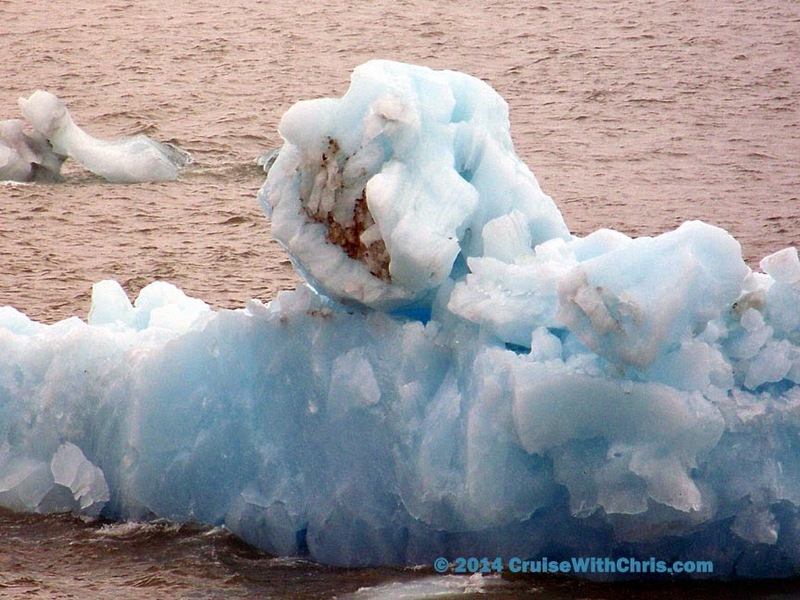 If you are planning a cruise to Alaska, be sure to pack your digital camera with plenty of spare memory cards, as we guarantee everywhere you turn you'll see crazy and beautiful shapes of nature that you'll want to capture in images. Ideally, you have a camera with a lens that has several different focal lengths, including a telephoto, so that you can get closeup shots. 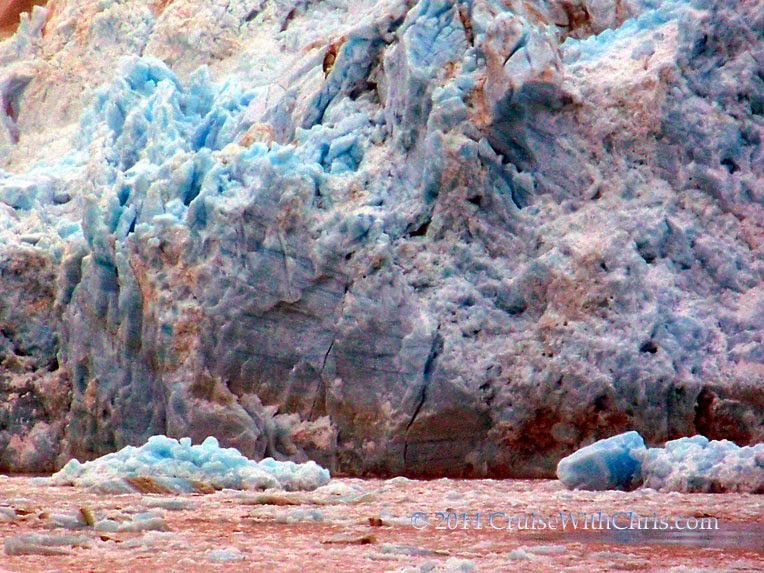 In this photo, the clouds are obscuring part of Hubbard Glacier giving an eery mood to the image. That definitely made this one of our favorite shots. We couldn't pick just one, so we've provided a few of our favorite shots here. Click on images to enlarge the picture. Each week we post images from our trips and participate in several travel chats on Twitter. Thank you to this week's co-hosts: @AntiTourist, @TheTravelCamel, @Sihpromatum, @VibrantIreland, and @travellingmolly. Join us for #travelpics on Monday's at 3 PM ET every week for a fun-filled hour related to travel and photography. Today is an exciting day in the construction of Royal Caribbean's newest ship, Quantum of the Seas. In nearly 4 months, the ship will begin its actual career when it sails to the United States for its launch. It will only be in the U.S. for a short period of time before it repositions to Asia where it will take up residence in its home port of Shanghai, China. 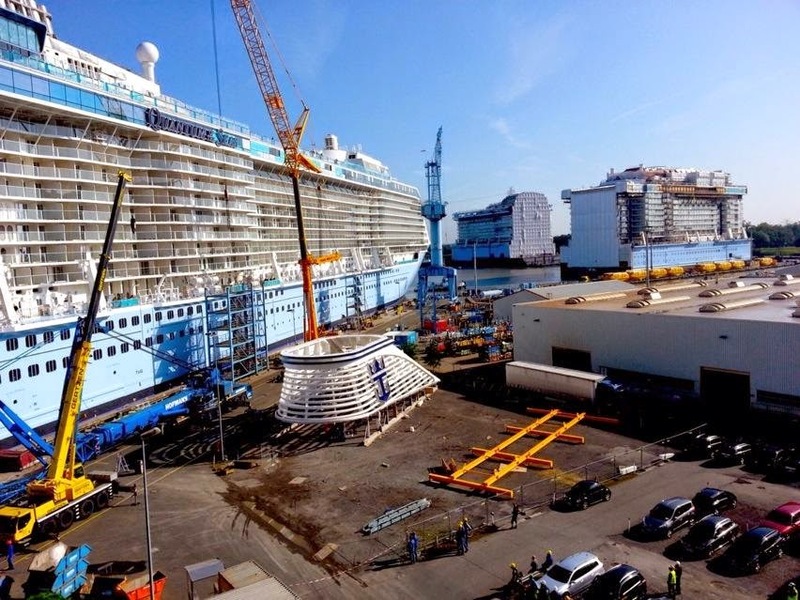 Quantum of the Seas will hold 4,180 passengers, vastly increasing the company's capacity in China by 66 percent. Today we join #TRAVELPICS chat on Twitter for a fun packed hour exchanging ideas and travel photos with like-minded posters. Q2: What is your favorite “non-sport” sport to play at home or abroad? Photo of you doing it? The photo above was taken earlier this year on Carnival Conquest. 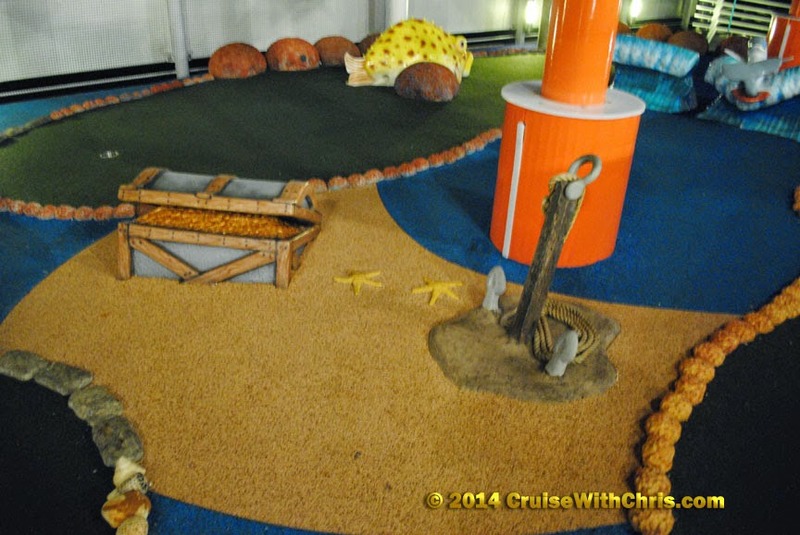 One of our favorite activities on a cruise is to get in a round or two of what we call "Goofy Golf". 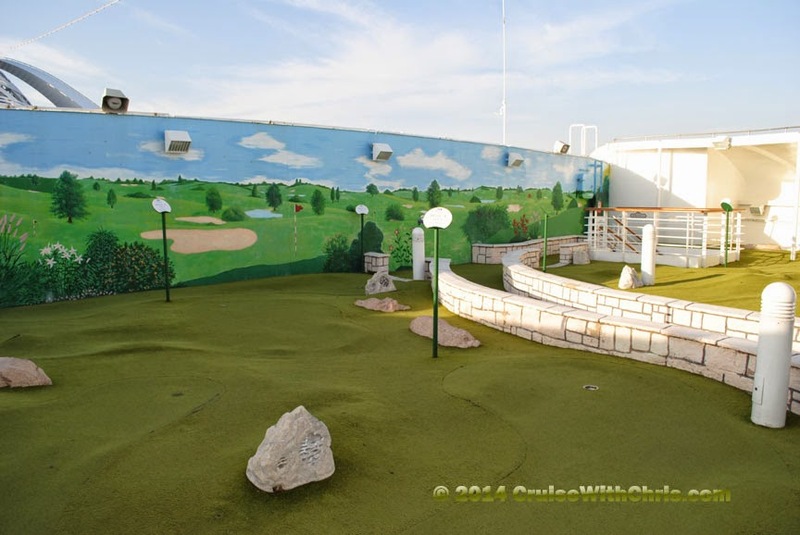 We can't think of a better place to play a round of miniature golf than on a cruise ship. You can't beat the view from the upper deck of the cruise ship. This question made us think. I wonder what cruise line and /or ship has the "best" golf course. We will include a few of our ship courses here and invite you to comment here or on Twitter - include your own pics if you have them. 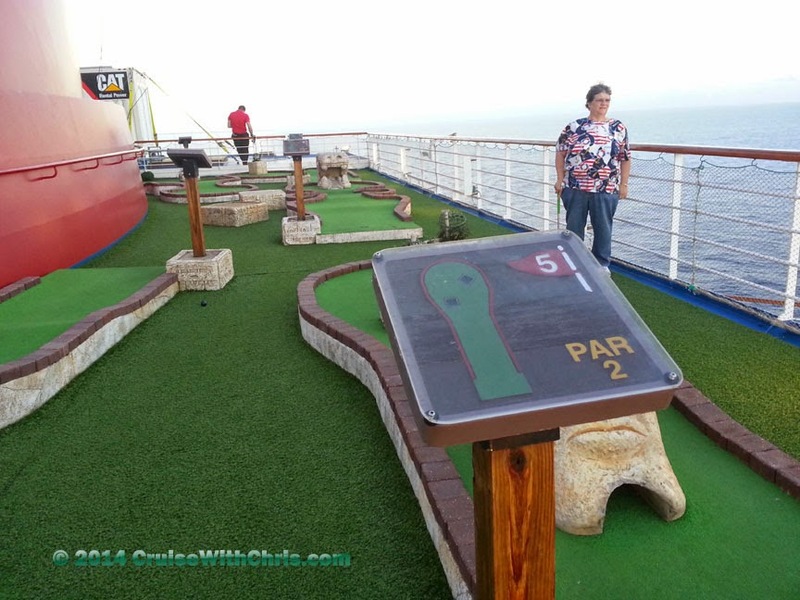 This course on Star Princess recreates the golf course "greens" you might find on land. There's a mural for the wall that contributes to the illusion that you are playing at your favorite country club. The holes might look simple, but it is challenging non the less since you have the added challenge of making shots on a moving ship. Each day's play could be different depending on wind and sea conditions. Both the Princess and Carnival course have a lot in common in that they have pretty simple decorations for the holes, giving you more of a feeling that you are on a country club course. 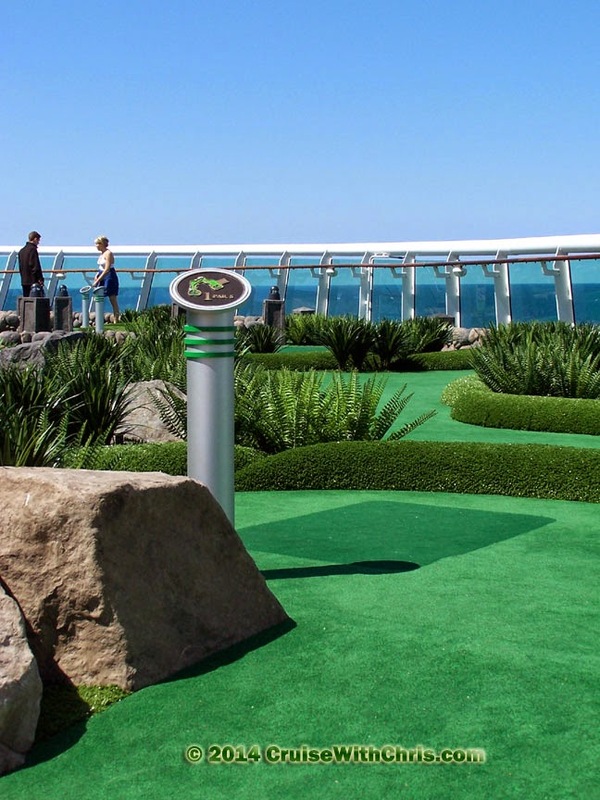 Our next "goofy golf" course is on Royal Caribbean's Liberty of the Seas. You'll notice that it is similar to the Conquest and Star courses, but there is a bit more "landscaping" involved in the course. As always, you can't beat the view as you wait for your opponents to finish their strokes. Not all courses are the same on this cruise line. Perhaps one of the more elaborate courses in our sampling is on the largest ship afloat, Allure of the Seas. The designers could do more when you have the room. The course on the Allure is great for practicing your putting. It is also pretty entertaining with the various golf statues. Click on any of the pictures for a closer look at the course. Final entry is the course on Norwegian Breakaway. 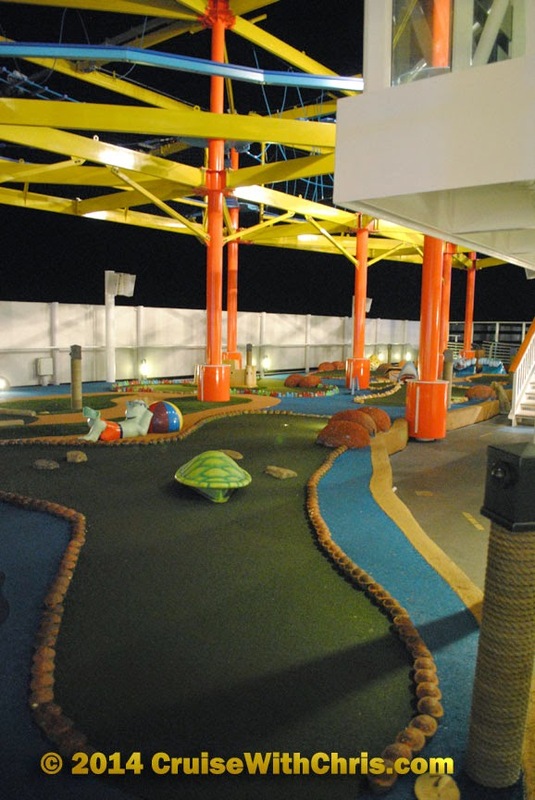 Day or night you can enjoy your favorite game of "goofy golf" on this course which is nestled amongst the elaborate sports deck on Norwegian Breakaway. 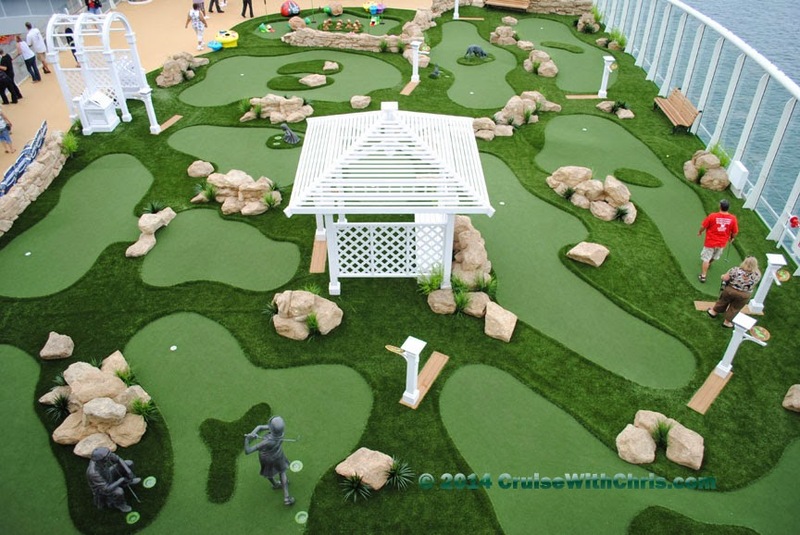 Of all the courses we have featured in this article, it is the closest to a traditional miniature golf course, complete with challenging holes and decorations in line with the theme. "Best" is such a subjective term, so we will leave it to you, the reader, to decide what you like the most. 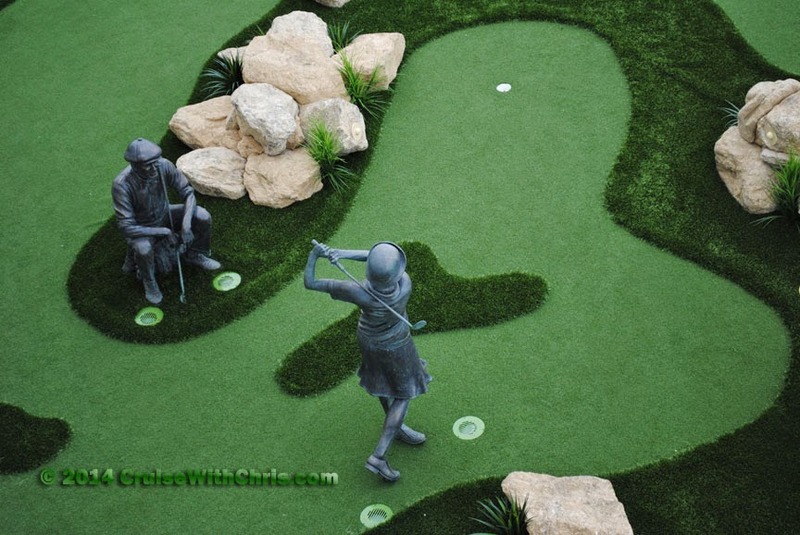 Perhaps none of these are what you are looking for in a "goofy golf" course. Do you have any additional entries you'd like to share with our readers? If so, tweet the pictures and details about what ship they were taken on and we'll publish some of those in a future article. If you don't use Twitter, you can send them to us via email. Follow us on Twitter: @ChrisPappinMCC Pinterest: CruiseWithChris Pappin and Facebook: CruiseWithChris Pappin Cruises Inc . This week's Twitter #FriFotos theme was #DISCOVERING. #FriFotos is a weekly photo forum by @EpsteinTravels @TravelDesigned @CharlesYap. Theme is revealed every Tues 12pm ET. Participants from all over the globe share their personal images with the audience. Here are some that we shared this week, we hope you enjoy this mini journey across the globe. 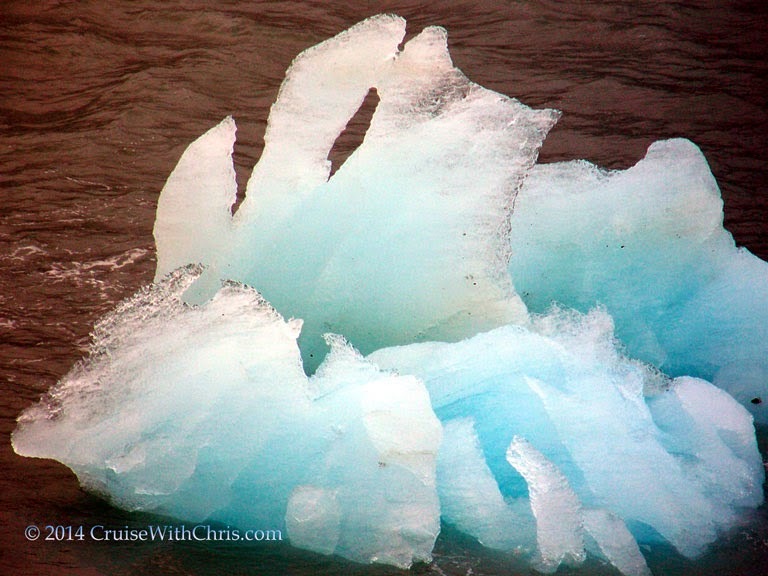 We've cruised to Bermuda multiple times and each time we discover new things. Bermuda is a very easy destination to explore as there is an excellent public transportation system which include public buses, ferries, taxi's and the newly added shuttle service. Private tours can be arranged dockside or in advance. Royal Naval Dockyard, Kings Wharf, Bermuda. From there we took a ferry to Hamilton and then walked to the Bermuda Underwater Exploration Institute (BUEI). There are many opportunities for hands-on discovering. There were many exhibits at BUEI for us to explore, but perhaps the highlight of our visit was the amazing shell collection, some of which is pictured in our cover image. 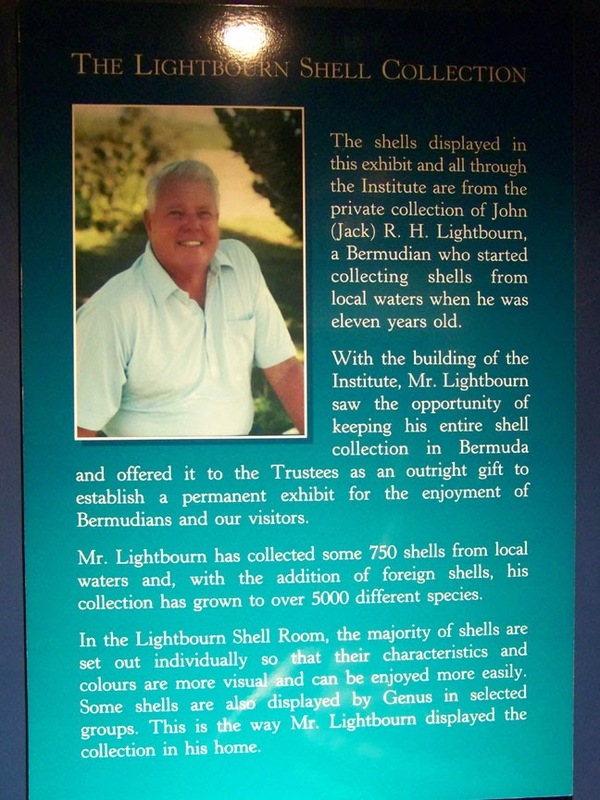 We could have spent hours discovering the Lightbourn Shell Collection. As lovers of the sea, this is a must see attraction while in Bermuda. For more images and details about activities while docked in Bermuda, see our previous article: King's Wharf Bermuda. 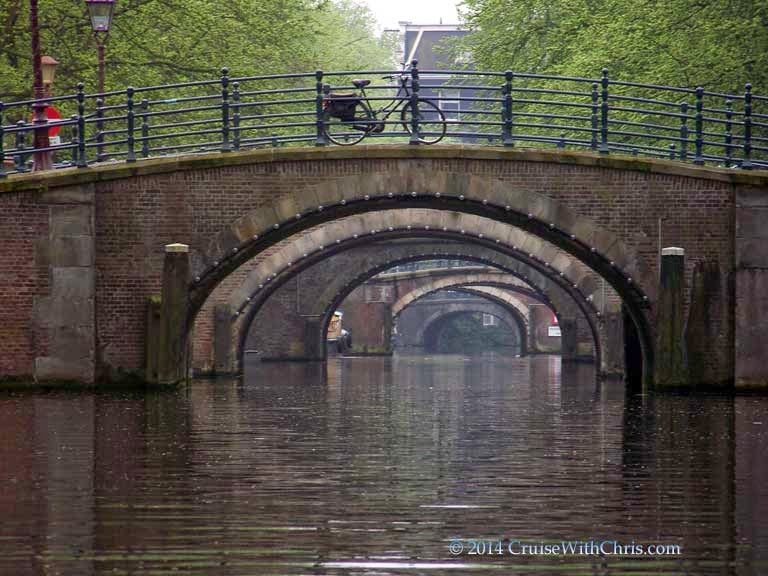 Our next stop during our #FriFotos photo tour was in Amsterdam. 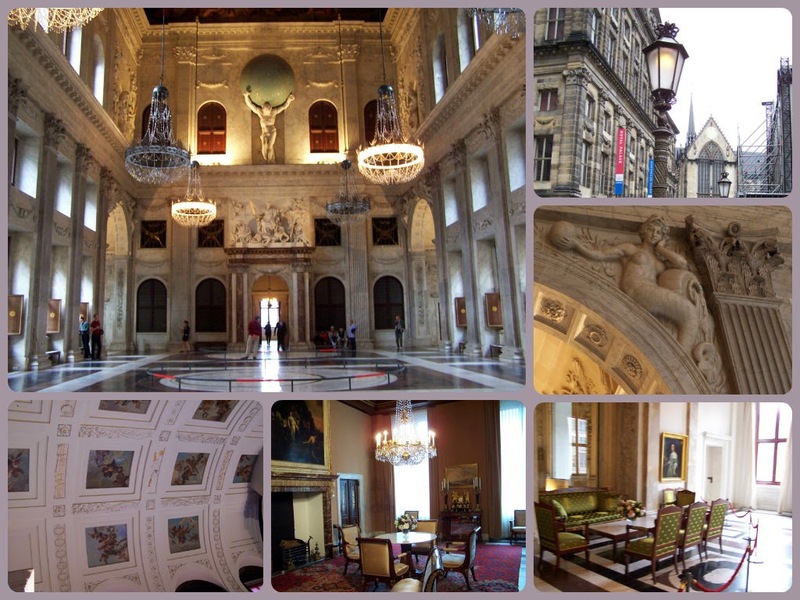 One of the places you can discover is the Royal Palace. Once again, we spent hours touring the palace and capturing images documenting our visit. Amsterdam is another city that is easy to explore. The best way to get around is by canal boat water taxi. It doesn't operate all the time, but if you are there during high season, you can get on and off as you please, explore the destination and then continue to another location or return to your ship. There was also a bus, which cost 1 euro when we were there, that takes you all around town. We caught it right across from where our river cruise ship was docked. The final destination we'll share with you in this article is Galapagos. This is a Land Beyond Xpectations which we have covered in great detail in our article: Diary of Celebrity Xpeditions Galapagos. 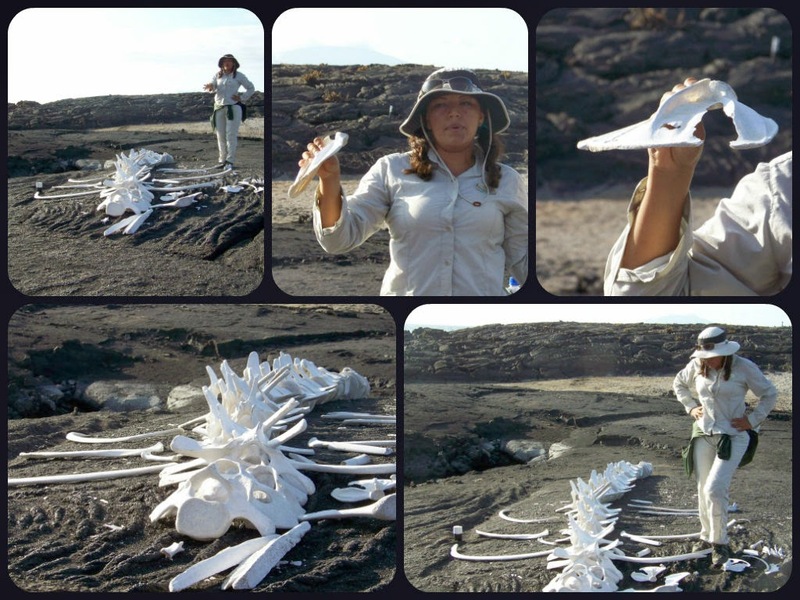 Shown here is one of our Naturalists explaining the fossil remains found on Fernandina Island. Each day there were at least two opportunities to discover more about the land where Darwin explored many years ago. Here you will discover a land that is inhabited by species that can be found nowhere else on earth. We posted several more images from each of these destinations as well as images from Ireland, Norway, Netherlands, and Canada. The images can be seen on our Twitter Photos tab. These are just a subset of the destinations which can be explored by cruise ship. Each week we feature a few of our images in the #cruisechat, #travelpics and #FriFotos Twitter chats, which are our favorite outlets for sharing with our followers. 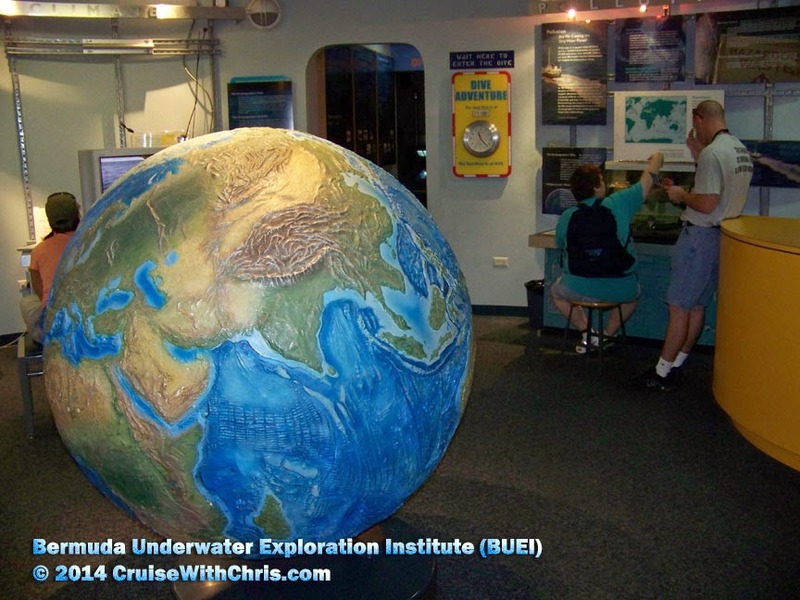 Please join us each week to Discover the World by Cruise Ship. Not one, but two Hurricanes are heading for the Hawaiian Islands. Iselle still heading for the Big Island, maintaining hurricane intensity. On the forecast track, the center of Iselle is expected to pass very near or over the Big Island Thursday night, and pass just south of the smaller islands Friday. Maximum sustained winds are near 90 mph, 150 km/h, with higher gusts. Some weakening is forecast during the next 48 hours, but Iselle is now expected to be a hurricane as it passes near or over the Big Island. Update: Iselle was classified as a tropical storm 11 p.m. Thursday Hawaii Standard Time when its winds slowed to 70 mph, putting it below the minimum of 74 mph for a hurricane. The storm is weakening because of several factors, including wind shear chopping at the system and the Big Island's terrain above the water, said Chris Brenchley, meteorologist with the National Weather Service in Honolulu. Early this morning, Julio strengthened to a Category 2 Hurricane.While there are no coastal watches and warnings currently in effect for this storm, interests in the Hawaiian Islands should monitor the progress of Julio. Update: Hurricane Julio, a Category 3 storm, is about 1,000 miles behind Iselle in the Pacific. Maximum sustained winds are near 120 mph, 195 km/h, with higher gusts. Julio is a category three hurricane on the saffir-simpson hurricane wind scale. Gradual weakening is expected through Saturday. At Norwegian Cruise Line, the safety and security of our guests and crew is of the utmost importance. Therefore, the company is closely monitoring the paths of Hurricanes Iselle and Julio in the Pacific. At this time, we anticipate embarkation for Pride of America’s August 9 sailing will take place as scheduled. Should there be any updates, they will be immediately posted on Norwegian's site. 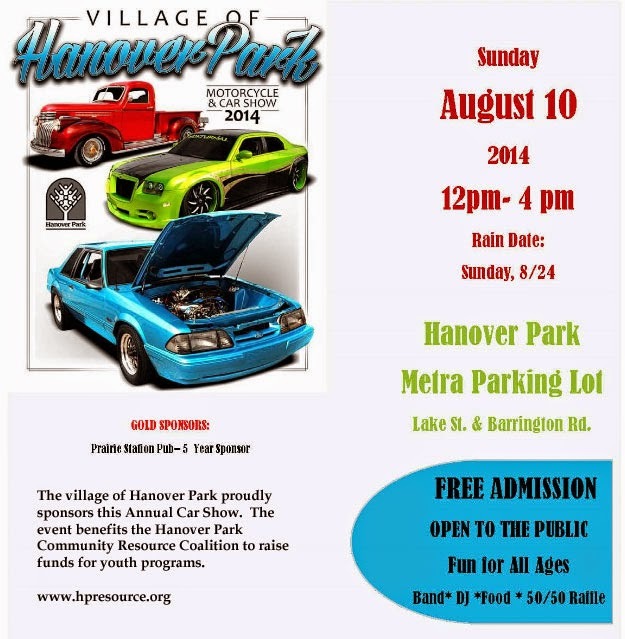 Attention car enthusiasts - don't miss the Hanover Park Motorcycle & Car Show this weekend in Hanover Park, Illinois. This charitable event, which benefits children in the area, will have motorcycles and cars of all shapes and sizes as well as a vendor show. Would you like to see some of the fastest cars in the world compete? We'll have information at our booth about the 2015 Grand Prix voyages on Azamara Club Cruises. Monaco Grand Prix. Join us for the renowned Monaco Grand Prix, one of the world's most challenging Formula One races through the narrow streets of Monte-Carlo. The thrill of screaming engines and burning tires is matched by glamorous crowds and yachts, buzzing helicopters, and celebrities who know a good party when they see one. Once again, Azamara Club Cruises is offering a 5 Night Grand Prix Voyage, which will be in Monaco on race day. 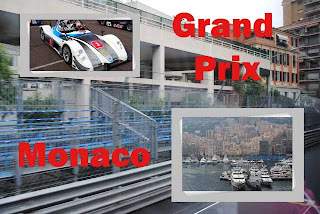 Whether you purchase Grand Prix tickets and watch the race, visit the Grand Casino, or other nearby attractions, your day in Monaco will certainly be one of the highlights of your cruise vacation. Last week we shared photos on the theme of “exotic,” on #travelpics Twitter chat. We included exotic birds, animals, and destinations from our photo archives. It was difficult to pick just a few to share. 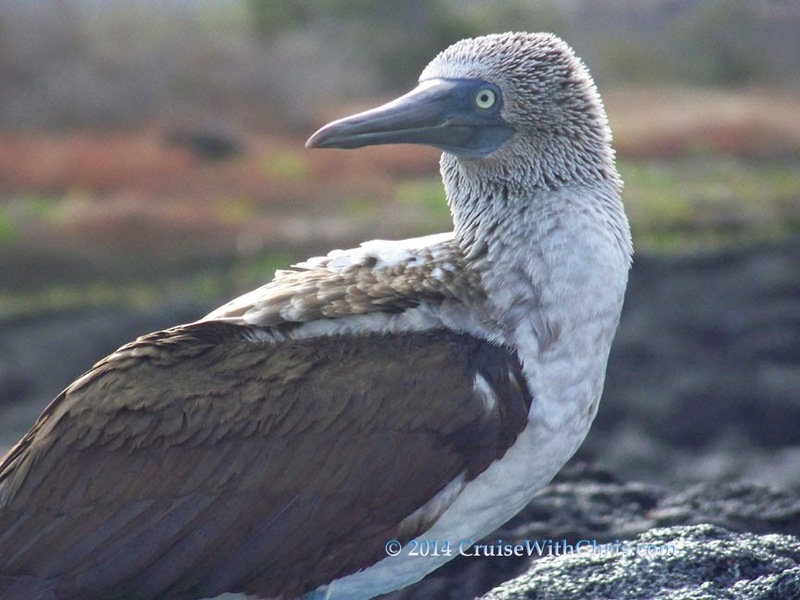 This Blue-Footed Booby was one of our favorite exotic bird species inhabiting the Galapagos Islands. Over one hundred fifty years ago, a man wrote about his quest that took him to a place where he would discover how life evolved thousands of years ago. Our ultimate exotic destination is an archipelago of volcanic islands near the equator in the Pacific Ocean. 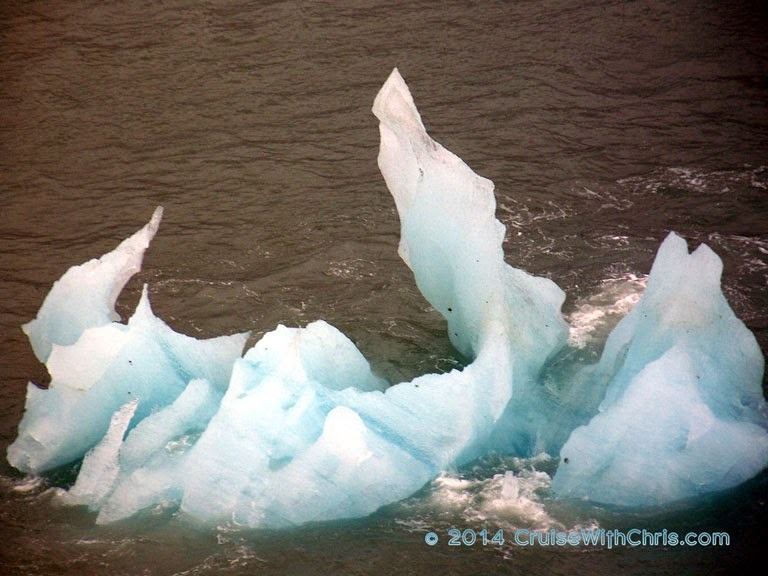 We were met by a team of naturalists who transported us by Zodiacs to our waiting ship, Celebrity Xpedition. You can see Celebrity Xpedition in the distance from our beach vantage point on Fernandina Island in this photograph. This isn't your typical beach as you can see. 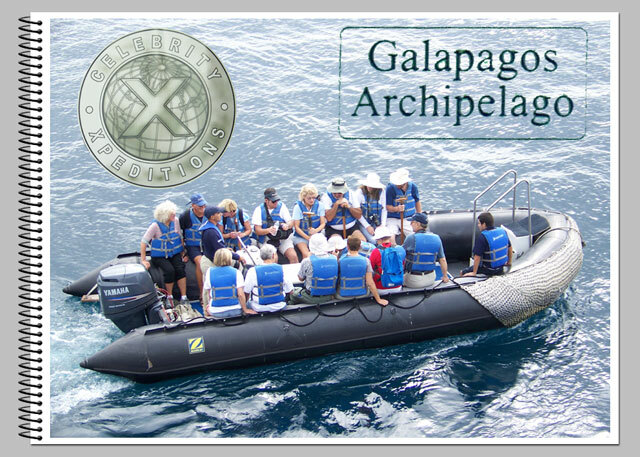 We've written an entire series of articles, Diary of Celebrity Xpeditions Galapagos, on our journey to exotic Galapagos. When #travelpics posted the theme for this past week, that destination was the first thing that came to mind. Looking at the questions below, we bet that you already know our answer for Q6. Our second choice for exotic destinations was Tahiti (French Polynesia & Cook Islands). 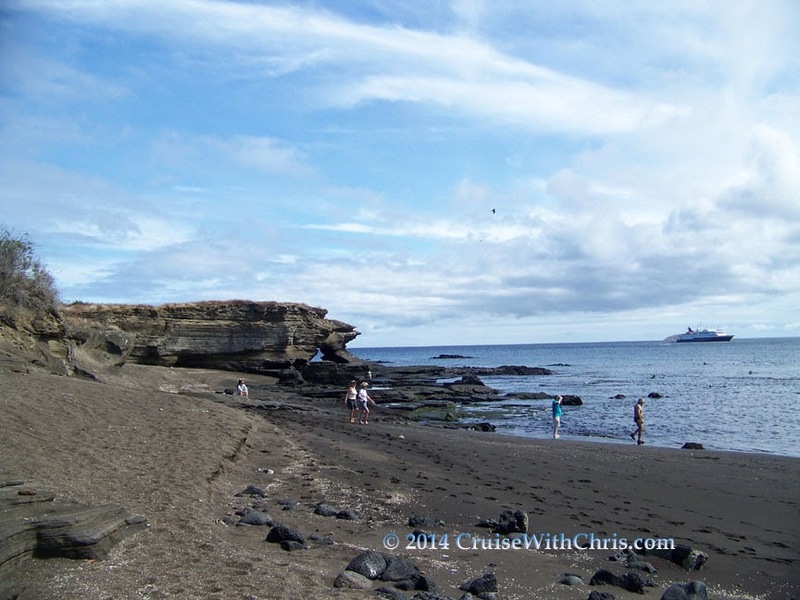 We were fortunate to cruise the Tahitian Islands on Tahitian Princess before it was renamed. That ship is perfect for traversing the island chain. 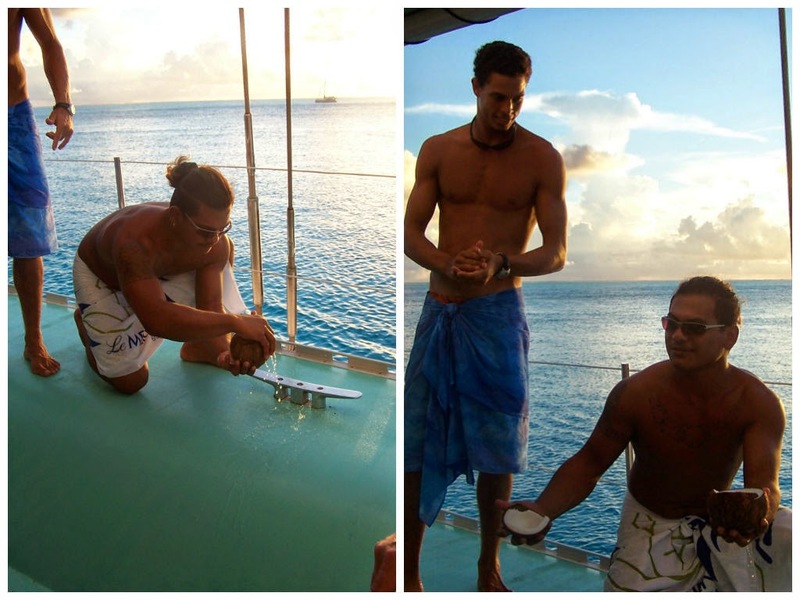 In this image, the crew on our catamaran treated us to some fresh tropical coconut. Exotic food, flowers and scenery made this our number two pick for this week's travel photo chat. (3:05) Q1: What’s an exotic location that you’ve never been to, but are eager to visit? (3:10) Q2: When you think of the word “exotic,” what do you think of? Share your travel photo interpretation. (3:20) Q3: Share a photo of something exotic you found in the natural world! (3:30) Q4: What is it you like most about exotic locations? Scenery, weather, people, cuisine, customs…? (3:40) Q5: Scenery often makes a spot exotic. Tweet a shot of a stunning location. (3:50) Q6: What’s the most exotic place you’ve ever seen? What made it incredible? Do you have an exotic cruise adventure to share with our readers? We'd love to hear about it and see your travel pictures. Contact us for an opportunity to share your story. The next #travelpics will take place Monday, August 4th, 2014, from 3-4pm Eastern time (8-9pm UK time). This week’s theme is “quickfire,” so get ready for a dozen fast-paced questions on photography, travel, and more! Take advantage of these resources to assist in you in planning your dream vacations. Of course, we are always available to answer any questions you might have about travel and the industry.